You have subscribed to a dedicated IP to send campaigns with your own name and using your own signature (SPF, DKIM, DMARC), thus gaining better control of your reputation. You have already completed the 1st step of the set-up: the delegation of your sub-domain. We will now see how to finalize the set-up of your dedicated IP. Then, go to "Your dedicated IPs"
You will come to a screen that contains all the information on your dedicated IP. You will set up a dedicated IP by clicking on Associate a domain. Automatically delegate your domain name: everything is automated and therefore easier. Select the name of your domain (or sub-domain) you delegated on the first step (in our example: newsletter.mydomain.com). 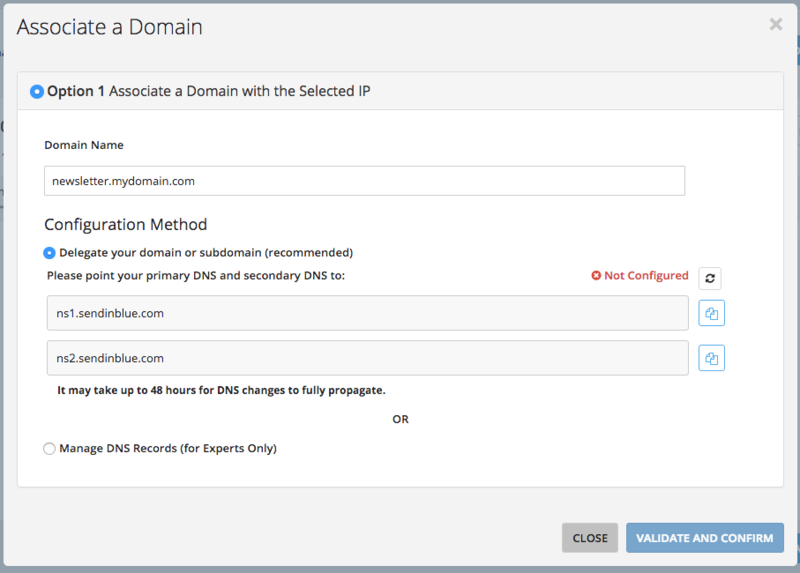 Then, verify if primary and secondary DNS are configured and validate. Note: that there may be a delay of 24-48 hours before your DNS are properly propagated.